I caught this on Roma Bike Polo. I don’t know what it says but I like that at the bottom of the article they list this site for more info. This entry was posted by Doug D on November 9, 2009 at 4:09 pm, and is filled under Bike Polo, Italy, Media/Press, Products. Follow any responses to this post through RSS 2.0. Both comments and pings are currently closed. Hi Doug, thanks for sharing the article. we need to improve our blog with an English section… we are thinking about it. However, the article is published by a fashion weekly magazine and we have mentioned because we think it is partisan. 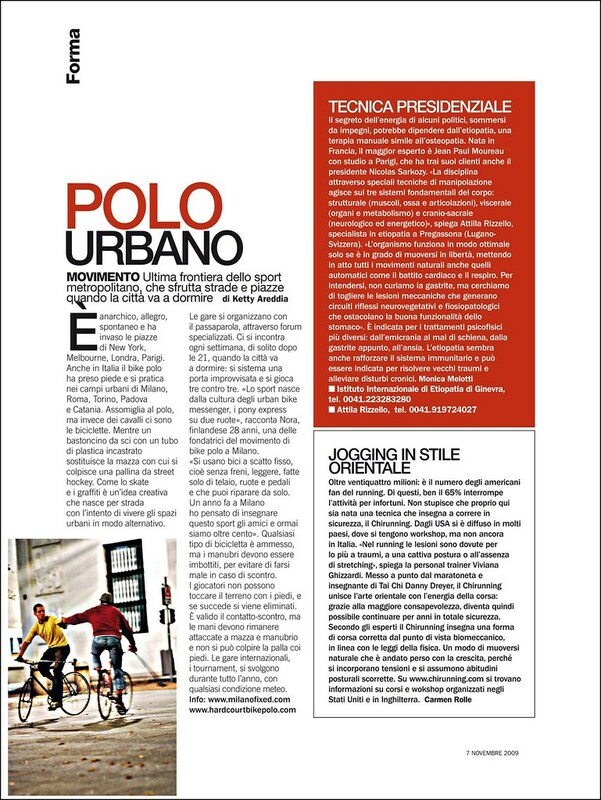 The article discusses the bikepolo as limited to fixed brakeless bike. Now, even if history may be true, one of the basic rule of HCBP is that you can use any bike. Nora, the Finnish girl interviewed in the article, says he brought the bikepolo in Milan, where there are now almost a hundred players, everyone on fixies. Almost all of us in Rome play with rear brake and freewheel, even those who started with the wheel fixed. We are not against fixies, some of us still have a fixed gear for traveling through city, simply we find free wheel, short gears and rear brake are better choices for BP. However everyone is happy bout the fact that italian media are slowly starting interesting in this wonderful sport. I saw your profile’s story and read about the Tournaments you havee won. Best compliments, you are a tough team. by the way, do you play on a fixed or freewheel bike? Well let’s keep in touch and let us know if you take a trip to Italy. Here is another Popular Mechanics article. May 1931. The Amazing Return of the “Bikes” Popular Mechanics Magazine January 1935 Some “bicycle basketball” looking more like rad ball. Seen in Popular Mechanics. Click any image to view large enough to read the text. I’ve never seen this mag but hardcourtbikepolo.com is listed for web credit right below the writer and photo credits. thanks. Some good stuff in this issue. A pretty photo set of bike polo and an I Love Riding in the City from Capt. Jake! Look for it as you flip thru. Click any image to see large I guess now I’m an “alterna-sport junkie” and a “good bike-poloer”. Doesn’t matter, bike polo is still fun. Come join us, play a game!